This "Historically Speaking" column appeared in the Exeter News-Letter on Friday, February 14, 2014. The dam seems like it has been here forever, but we know it has not. The native people who lived in Exeter for thousands of years before the English arrived did not dam the river. They set up fishing weirs to trap the migratory fish, but these allowed a free flow of water and not all the fish were impeded on their trek up and over the falls for breeding. Englishmen, led by the Reverend John Wheelwright, arrived in 1638 and were attracted to the waterfalls on the river for commercial reasons. River water could be harnessed and used for all manner of mechanization. Mill wheels could be erected on nearly any type of moving water. Pinning down the exact date of construction for the Exeter dam has always been difficult. The reason the Exeter Historical Society and the recent study completed by Vanasse Hangen Brustlin, Inc. for the Town of Exeter cannot provide a specific date is that we simply don’t know. The records are sparse on the origins of the dam. The first mill erected on the river was Thomas Wilson’s grist mill, which produced flour or cornmeal on shares. Wilson was granted the right to build his mill in 1639 on the east side of the river at the lower falls. It’s entirely possible that Wilson’s was the first dam on the river. Dams located at Kimball’s Island can be seen on the earliest map of Exeter, made in 1802 by Phineas Merrill. There seem to have been dams on either side of String Bridge well into the 20th century, but they have been removed before the 1924 Sanborn maps were printed. The upper or ‘Great Dam’ – the one that still exists today – is located on roughly the same place as many earlier dams. Edward Gilman, Jr. was granted the right to build a much needed sawmill on both sides of the Exeter River in 1647. Although there is no direct evidence, it is presumed he constructed the dam at about this time. It is well recorded on the Phineas Merrill map of 1802 when there are any number of small mills located between and just below the two sets of dams. George Washington, during his 1789 visit to Exeter, noted, “in the town are considerable falls which supply several grist mills, two oil mills, a slitting mill and snuff mill.” For a time, there was great diversity in the type of production coming from the Exeter River. All this would stop when the industrial revolution came to town in the form of the Exeter Mill and Water Power Company in 1827. After a careful assessment of the river, it was determined that a large textile factory could be built if water rights could be secured. The Exeter Mill and Water Power Company bought out all the small mills and water rights along the river to supply power to the newly created Exeter Manufacturing Company. The dam was mentioned at a meeting held on January 30, 1828 granting the Exeter Manufacturing Company use of “the water in Exeter River raised by the present dam erected across said River at the upper falls in Exeter village, or which may be raised by a dam to be erected at or near the same place and of the same elevation and height as the present dam, and to be erected and forever repaired and maintained by the grantors and their successors.” This doesn’t tell us the state of the dam or how it was constructed, but it is an indication that it was commercially valuable. In 1861, the Exeter Mill and Water Power Company signed over all rights to the Exeter Manufacturing Company. From here, the history of the mill becomes the story of the Exeter Manufacturing Company. We’ve puzzled over what type of dam it was – the only hints came from reports of spring floods when the flashing boards are reported as being scoured away by ice floes. The top of the dam, at least, seems to have been of wood. Four huge water wheels supplied all the power for the mill until the 1870s when a steam plant was erected. The wheels were fed water through a penstock that snaked underground below Chestnut Street. Sometimes referred to as a ‘flume’ the penstock needed frequent upkeep and repair. In 1913, the Exeter News-Letter reported that “The Exeter Manufacturing Company is about to build a concrete dam and flume to replace the similar structures of wood” and we finally get an idea of what the old dam was made of. It wasn’t uncommon to have a dam made of wood, but concrete made the structure much sturdier, and indeed this is the same dam that stands today. It was topped with an extra 14 inches of concrete in 1943, “to give more water and consequently more power – thus displacing the flashboards used to raise the level of the water.” The Exeter Manufacturing Company continued to supplement electric and steam power with water power until it was sold in 1954. In 1968, to address the problem of fish migration, the New Hampshire Fish and Game Department installed a fish ladder and weir, which has proved to be only marginally successful. It seems the fish have suffered since the first dam crossed the Exeter River in the mid-1600s. The Town of Exeter has owned and controlled the dam and water rights since 1981, when Milliken, the parent company of Clemson Manufacturing Company determined water power was no longer necessary for production, thus ending the river’s industrial use. The dam stands today as a reminder of our manufacturing past. 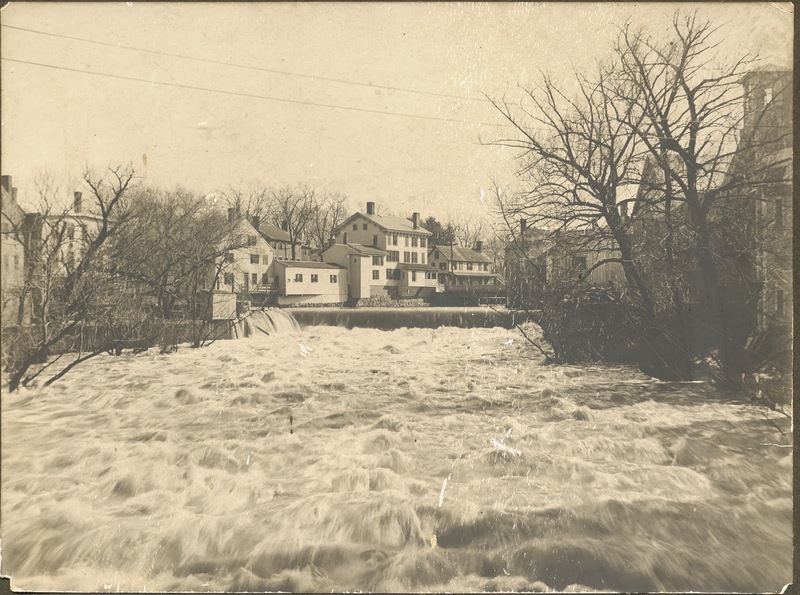 Photo: The Exeter Dam during a spring freshet, March 1, 1902. This dam was replaced in late 1913 with a more permanent concrete structure that took over four months to construct.